Last modified on March 15th, 2015 by Joe. This Android tutorial will walk you through to create a location tracker using Android location API and Google maps services. This deals mainly with two areas, using the location API to continuously get the user location and then showing that lat-long position in the Google maps. Refer the Android location using fused provider tutorial to understand better about the Android fused location provider API and how it can be used to access the user location. Next read through the, Markers–Google Maps Android API v2 to learn about showing a Google map and mark a location using latitude/longitude points. Create SHA1 Android key by running the following command in cmd prompt (you should have JDK installed and PATH setup). Grab the SHA1 value from the above cmd prompt and then go back to Google Console to create Android API key. Go to menu “APIs & auth –> Credentials” in ‘Public API access’ click create new Key button. Then used the SHA1 key generated and the android application package to create and get the Android API key. Add Google Play Services to project dependency. Just add the following in Gradle dependencies. I am using Android Studio to develop apps. Long back I have migrated from Eclipse to Android Studio. There are numerous advantages and I recommend you to move to Android Studio as quick as possible. The last dependency in the Gradle is for ‘Google Maps Android API Utility Library’. I have used it to display the time as title in marker for Google maps. This is optional and you can ignore it without compromising the functionality. 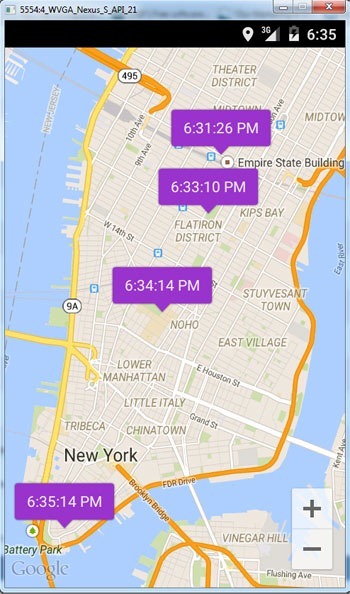 I have configured the App to track the location every one minute. You can configure it in the constant INTERVAL and FASTEST_INTERVAL. Keep the INTERVAL higher and FASTEST_INTERVAL lesser or equal than that. For example, if you want to track location every five minutes then INTERVAL can be 1000 * 60 * 5 (five minutes) and FASTEST_INTERVAL can be 1000 * 60 (one minute). We are using Fused location provider API and internally it makes best judgment on which provider to use. INTERVAL does a real check using GPS or NETWORK_PROVIDER and that is a costly operation, it can drain the power. FASTEST_INTERVAL does gets location from other apps if available. If you want to draw lines between the location points, refer the Draw lines on Google Maps Android API tutorial. We will get an innate feeling to draw path lines between the locations. But logically that is not right. We are finding only the location latitude and longitude points. We cannot predict the path the user has taken between those points. So its not appropriate to draw path between location points. Comments on "Android Location Tracker with Google Maps"
Error:(1, 0) Plugin with id ‘com.android.application’ not found. What should i do help me out?? I have resolved this problem by adding the below code in top level build file but in this project structure there is no such file so I just created new project and all done . But I m not getting anything in that map view now working on that. // *************************************************Top-level build file where you can add configuration options common to all sub-projects/modules. Hi ,Can you help me for i need to track the location of the person whose contact saved in my phone..
Hi i run this code with all the appropriate fixes but nothing is shown on my device.. Comments are closed for "Android Location Tracker with Google Maps".